After the martyrdom of Joseph Smith in 1844, enemies of The Church of Jesus Christ of Latter-day Saints (commonly called the Mormon Church) hoped and really thought the Church would dissolve with the death of the Mormon prophet. However, the faithful Saints persevered and followed God’s plan for them. There were a few, though, who were led astray by a man who claimed to have been appointed as successor to the prophet by the man himself. James Jesse Strang claimed he had a secret letter which Joseph Smith had written, designating Strang as his successor. Though the vast majority of the Saints remained with the full body of the Church and followed Brigham Young as God’s new chosen prophet, a few believed Strang, at least initially, and chose to follow him. There were many similarities between Strang’s claims and those of Joseph Smith. These similarities are undoubtedly what caused people to follow him. Strang declared he had ancient plates as well as the power to translate them. He also had eyewitnesses to the plates. People believed Strang and followed him to Beaver Island, Michigan, where he eventually amassed several thousand followers until he was murdered in 1856. Strang claimed to have two sets of plates, the Voree and the Plates of Laban, which he said he found in Wisconsin and Michigan. With so many witnesses, it is likely the plates did exist. However, they were also almost certainly forgeries. The first set were very small, about 1.5×2.75 inches. One of the men who witnessed the plates said they were made out of brass, but also said the brass looked of the same type as that used in ordinary kitchen kettles. This witness, Stephen Post, said, “With all the faith & confidence that I could exercise,” he wrote, “all that I could realize was that Strang made the plates himself, or at least that it was possible that he made them.” The witnesses of this set of plates nearly all eventually withdrew their testimonies. The second set of plates was bigger and were seen by seven witnesses in 1851, though Strang first mentioned them in 1849. Strang translated these plates into a work he published as “The Book of the Law of the Lord.” At least one of the witnesses to these plates denied Strang had any inspiration and stated the whole thing was of “human invention.” Samuel Graham, another witness, later stated he had helped Strang make the plates. The support this incident gives to Joseph Smith is that none of Strang’s witnesses claimed to see anything supernatural; they only saw physical plates, which some denounced later as fakes. In addition, Strang, an editor and lawyer, took almost ten years to “translate” plates which were far less numerous than those Joseph Smith claimed to have. 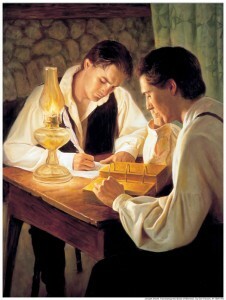 Joseph Smith was only semi-educated according to the standards of the time, yet he translated hundreds of pages worth of material in just more than two months. Lastly, most of ‘ witnesses later denied their testimonies, while none of the witnesses to the Book of Mormon ever did. It is quite evident that the scripture which claims “by their fruits ye shall know them” is fulfilled in both Smith’s and Strang’s cases. Original Article: “The story behind James Strang and his sect,” by Dan Peterson.